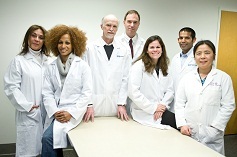 The Quality Improvement and Clinical Innovation Committee, chaired by Dr. Michelle Hickey, is focused on integrating quality themes into the clinical, operational and educational efforts of the faculty and staff of the Department of Pathology and Laboratory Medicine. Quality improvement projects are ongoing throughout all areas of the laboratory that support the MOVERS quality vision of UCLA Health. 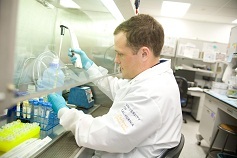 The department has a large footprint in clinical service with over 6 million tests (3.1 million inpatient tests) performed annually and over 200,000 surgical pathology/cytology cases annually. With 74 faculty, 22 residents, and over 500 staff involved in hospital and research activities, we are committed to transformational change through value-based care redesign and quality improvement research. The purpose of REQIPP (Resdient Education Quality Improvement Program - Pathology & Laboratory Medicine) is to actively engage residents and fellows in the evaluation and development of the pathology and laboratory medicine quality improvement programs while facilitating the departments’ quality improvement priorities. Our trainees are encouraged to participate in both departmental and multidisciplinary projects. The program will assist in the identification of new quality improvement initiatives in an effort to standardize care and improve outcomes for UCLA patients all while achieving the ACGME and ABP Pathology Milestones. The programs curriculum includes QStream a quality improvement focused mobile software implemented for UCLA Housestaff and focused lecture series. Our trainees also have the opportunity to present their QI projects during our annual Quality and Clinical Innovation Day. Abstract submission and publication are also encouraged. Our goal is to standardize transfusion practices, reduce routine 2U RBC orders and avoid transfusion at Hb ≥ 8g/dL in stable patients. Our strategy is to implement CPOE best practice alerts (BPA) triggered based on patient Hgb and physician order, provide timely, data-driven feedback and targeted education, and forming a multi-disciplinary team consisting of hospitalists, transfusion medicine (transfusion safety officer), nursing, and IT. By steamlining our process for specimen hand-offs and aliquoting, we have been able to significantly reduce the TATs on HPV testing. UCLA uses the electronic crossmatch (EXM) as a safe and efficient alternative to a serologic crossmatch method to ensure ABO compatibility for patients with no previous or current history of clinically significant antibodies. 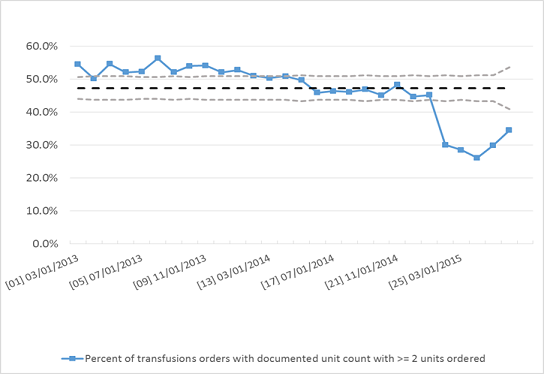 Following implementation of CareConnect and computerized physician order entry (CPOE), the blood bank observed inefficiencies associated with increased duplicate and excess orders where many blood units prepared were never requested (issued) for transfusion. To address the workload and blood inventory constraints associated with these inefficiencies, we implemented a new policy where orders from patients eligible for EXM are pended until actual issue requests were received. This policy reduced the number of crossmatched units that were never issued from 840 to 300 units/month, improved work place efficiency and improved inventory management, while maintaining clinically acceptable issue turn-around-time. Point of Care (POC) tests are laboratory tests performed directly in the physician office and are of extreme value in providing an immediate result that can be directly acted upon by the provider. These tests are built to be easy to perform, however still require quality control to ensure the test kit provides accurate results and that the person performing the test understands the test’s performance limitations. 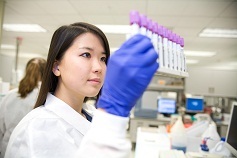 As the majority of POC tests are performed outside of the traditional laboratory setting, the goal of the POC Quality program is to improve quality of the POC testing within the UCLA Health System. This endeavor, in conjunction with Ambulatory Care Nursing, is being implemented through education of test reliability, standardization of POC tests performed, standardization of operator training, and through implementation of quality control guidelines. Collaborated findings and coordinated diagnosis. Improved information flow downstream to end-user and upstream to diagnosticians. Improved ability of both specialties to develop evidence-based technologies to further the healthcare enterprise. Dr. Michelle Hickey at 310-267-2427.